If you’re like me, you may be amazed at how the mail order industry has changed in the last 10 years. It’s incredible how quickly you can get something you see online delivered to your doorstep—often for free! How do companies like Amazon do it? Unfortunately, the hard truth is they do it on the backs of hourly workers. And now—just in time for the holiday shopping season—Amazon is offering free, same day delivery to Prime members on certain items in certain markets—including Columbus. What does this mean for workers? It means high-pressure, stressful working conditions that can lead to severe injuries. Think about what it takes to process an order, fill it, and send it out. Now imagine doing that all within two hours. Fulfillment center workers are under this stress daily. It’s no wonder that Amazon has been criticized for creating a dangerous work environment, even landing on the National Council for Occupational Safety and Health’s “Dirty Dozen” list of the most dangerous places to work in 2018. This report cites exposure to unnecessary and preventable risks at Amazon warehouses leading to the deaths of seven workers in a 5-year period. These working conditions put workers at risk of falls, forklift accidents, falling objects, and musculoskeletal injuries. Amazon has three fulfillment centers in the Columbus area—in Columbus, Etna, and Groveport. At these storage and shipping centers, “pickers” navigate a million square feet of warehouse space as they collect items to fill orders. 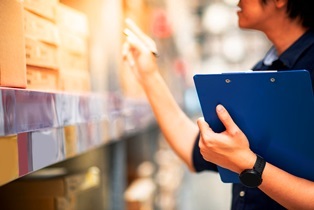 Working with a handheld device, fulfillment workers are expected to pull at least 100 items an hour, traveling an average of 12 miles per shift. Workers in other positions—such as sorting and stocking—also risk these injuries in fulfillment centers. Amazon employs about 90,000 year-round workers at fulfillment and sorting centers across the country, but during the peak season leading to Christmas, the company adds nearly 100,000 temporary workers to meet the heavy demand. If you're working for Amazon as a temporary seasonal worker in Ohio, it’s important to understand your rights. Under Ohio Workers’ Compensation law, if you're are injured while doing your job—even if you're a temporary, part-time employee—you're covered by the workers’ compensation system. This means that if you're unable to work because of an injury sustained on the job, you're eligible to receive coverage for medical expenses and lost wages. Amazon and its temporary staffing agencies have no great track record of helping injured workers. Employees have had trouble with not being believed when they report an injury and difficulty filing workers’ comp claims with the company. Some workers even state they were fired after a workplace injury. Don't stand for this treatment! You may need a lawyer to ensure your rights are protected. Contact me at Monast Law Office in Upper Arlington if you're getting resistance from Amazon—or any other company in Ohio—following an on-the-job injury. Give your family a prime gift this holiday: call us to discuss your workers' comp claim. You know, the one that's driving you and your family crazy since your trying to handle it yourself!